Pierogis oh how I love thee. But the can not be eaten plain, they must be dressed. For this recipe I dressed them with caramelized onion, tomato, bell pepper and garlic. I should have added bacon! Now I think of it of course. You can make them from scratch of course, I just don't have time for that. If you have never eaten a pierogi I highly recommend you try them at least once. You will continue eating them I promise. *Pierogi (Polish pronunciation: [pjɛˈrɔɡʲi]; also spelled perogi, pierogy, perogy, pierógi, pyrohy, or pyrogy) are boiled, baked or fried dumplings of unleavened dough traditionally stuffed with potato filling. Arrange the pierogies in an 11 x 7-inch glass baking dish coated with cooking spray. Heat a small pan over medium heat and melt butter. Add garlic, pepper and sliced onion; sauté in melted butter over medium heat until caramelized, about 10 minutes. 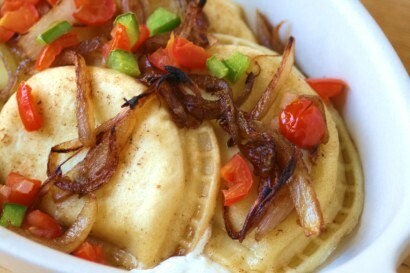 Top pierogies evenly with the onion mixture and sprinkle with tomatoes, salt and pepper. Bake at 400° for 20 minutes or until bubbly and thoroughly heated. Remove from the oven and dot with sour cream. I had completely forgotten about pierogies until now! I LOOOOOOOOOVED these as a kid and now you have convinced me to make them for dinner this week. Hopefully my daughter will love them as much as I did. And I love all the fancying up you did with these! Thanks for a great recipe!